Our Bank App builder provides an unparalleled opportunity for even the smallest bank/credit union to establish their business with a unique app experience. Not only will our app builder end your search for “how to build smartphone app,” it offers industry leading customer support along the way. Staying in touch with your customers has never been easier with the entirely customizable settings on our bank app maker. Furthermore, it will grant your customers special access to practically every service your company offers, directly on their mobile devices; including online banking and customer service inquiries. As the number one Android App Builder in the world, Appsbar.com can help build your bank/credit union’s app as an Android app, or build HTML5 apps and/or a Facebook app. If you are wondering how to make an app, create html5 apps or are looking for a html5 app builder, you have come to the right place. 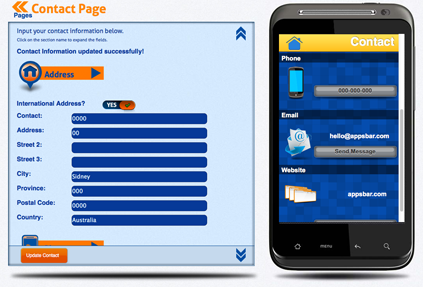 At Appsbar.com, we are very excited to offer you the opportunity to create mobile phone and tablet apps in the simplest format available. 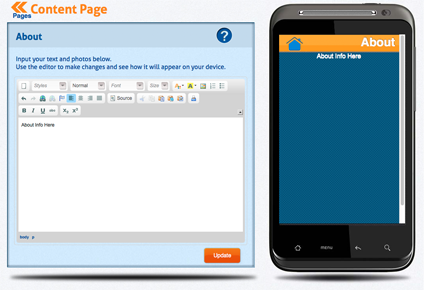 The chance to build a smartphone app so easily has never been offered in such a way by any other company. Not only are you be able to make smartphone apps offering your services, but because your company is in the banking industry, you can also now make a customized bank app for your own customers to enjoy. The About Page is your company’s bread and butter – it gives you the ability to add text, images, or a combination of both, to convey the purpose and basic summary of your company. You may include any other relevant information; such as, how to utilize your services, any distinct information about your company, and your company’s mission statement if applicable. The Schedule Page is a very simple depiction of your company’s hours of operation. It allows you to post the hours your company opens and closes for business; as well as, any other scheduling reminders—special events, holiday hours, workshops, promotions, and ATM locations. You can also add updated notifications to this section to advise your customers on the status of company events and/or promotions, as well as, the occurrence of any scheduling changes. The Services Page is the section to list and describe all of the services your bank/credit union currently offers to customers. You can also include extensive or simple descriptions of each service along with the price that corresponds to each service, including a companion image for illustration purposes. 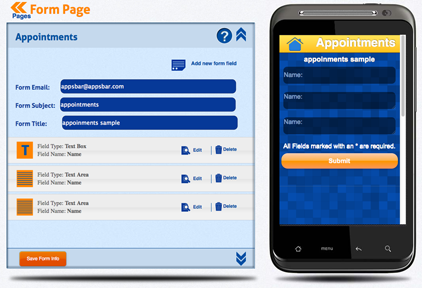 The Appointments Page lets your company create detailed and user-friendly forms for each customer to fill out and use to contact you specifically. Once a user fills out a form, the completed version will be sent directly to your company’s email address, which you will provide when initially creating the page. This feature is incredibly useful for maintaining active communication and a healthy relationship with your customers. 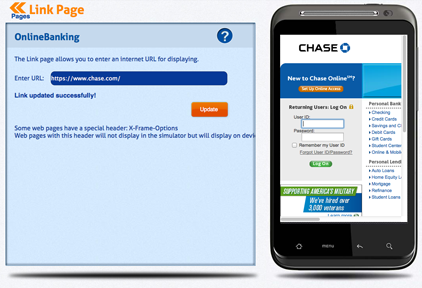 The Online Banking Page will likely be your most visited page on your app. 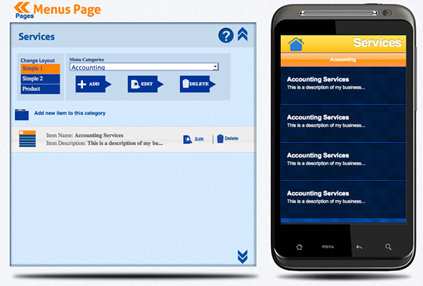 This page is the virtual portal for your customers to manage their accounts online. It is important to make this page the hallmark of your app, as it is the primary reason for the app in the first place. Doing so will allow you to put your company’s online banking URL directly into the app, granting your customers unlimited access to their accounts. The Social Links Page is basically a medium between your customers and the various social networking accounts established for your bank/ credit union. 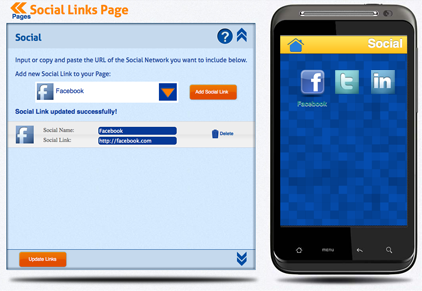 It provides the opportunity for users to instantly access all of your social networking updates and notifications. From “liking” your Facebook page, to following your company’s every informative tweet on Twitter, this section will increase your online presence dramatically and create a more modern brand image for your business; one that is sure to impress customers. The Contact Page is a mandatory section for your app, as it informs your users of essential contact information for your company. It also lets users know how to contact your customer service department. Most likely, you will provide basic information for your company; such as: physical address, phone, email, website URL, and any other information you feel pertinent. The Coupons Page is the premiere section for your marketing department. 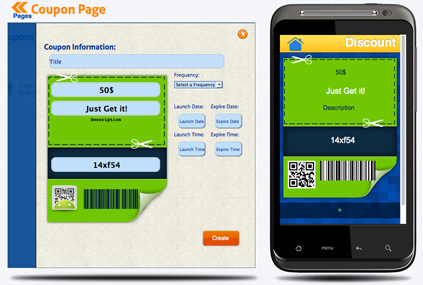 It allows you to create coupons and display various discounts that your users can use at your bank. You may be wondering what sort of coupons your bank could possibly offer through an app, but there are a number of viable options; including, future banking incentives for your customers. 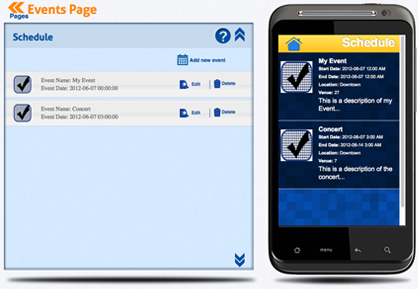 Your coupons can be open-ended or be created for use during a specific time frame.